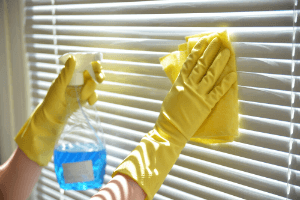 Window cleaning is one of the quite important and necessary domestic chores that have to be performed on a regular basis. But most people are not willing to invest long hours and lots of energy into washing and polishing their windows. It’s a hard work that takes a decent amount of skills, time and patience. Not to mention the cases when it can be dangerous to clean your high-floor windows with ladders and buckets of water. Don’t put yourself through all this! Use the services of a licensed window cleaning company in Stockport. Work with qualified and trained window cleaners who know how to tackle stubborn stains and water streaks. They will use only purified water and water-fed extension pole system to clean all glass surfaces, frames and sills from the safety of the ground. This process also reduces cleaning time and resource waste. Windows on the inside will be cleaned with a squeegee and distilled water.